The second edition of the Palestine Music Expo focuses on developing the industry for independent musicians in Palestine. "We Palestinians, have a unique story to tell the world that no one else can tell. All we need is freedom to create and perform. The rest will follow." 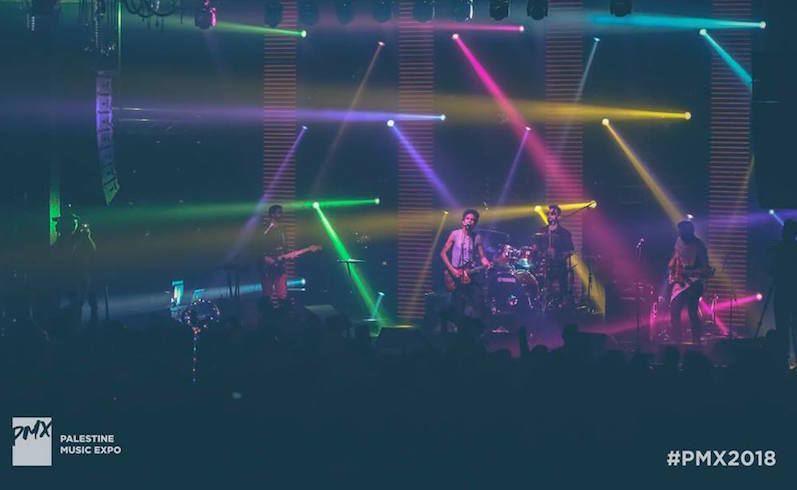 The second iteration of the Palestine Music Expo (PMX) took place from 11 to 13 April, showcasing various established and burgeoning Palestinian artists to local and international observers alike, stretching across Ramallah, Haifa, and Jerusalem. The Expo is an effort to bring together local artists and professionals from the international music industry together in order to provide a much-needed platform for the homegrown talents. We caught up with writer, director and co-founder of the expo, Rami Younis, who walked us through different stages of organizing PMX. The initial idea was concocted by Mahmood Jrere, a member of the DAM hip hop crew along with Abed Hathout, a musician and producer, Rami Younis, writer and director, and Martin Goldschmidt, the chairman of Cooking Vinyl, a London-based label group. The group met with artists and activists to hear about their struggles and the unique obstacles that they face as Palestinian musicians; born from this discussion was the initial blueprint for PMX, as a way to help these musicians, or as Rami mentioned to SceneNoise, "an idea from four tired individuals after a few intense days of touring Palestine and discussing music with Palestinian musicians." This extraordinary event manages to connect the local Palestinian music scene with the international music industry. Rami informed us that the Palestinian music scene is far from lacking musicians; what it lacks is proper organization in terms of producers, agents, managers, etc. Additionally, PMX is more than just one of the biggest festivals in Palestine; it offers a lot of workshops and round table discussions about live music and copyright issues for the artists to enable them to benefit from the experience of some of the key people in the music industry. The workshops comprised of different listening sessions whereby bands play their music and a panel of experts, give them feedback. Other workshops discussed songwriting, giving live performances. Some of the hosts included Lebanese artist Yasmine Hamdan, as well as Brian Eno about a creative retreat he was organizing in the West Bank. It was quite the experience for the delegates to meet the artists at their refugee camps. Unsurprisingly, they were really moved by their personal stories and their circumstances. One of the results of this exposure was that Saa’leek, a hip-hop crew from Qalandia refugee camp, was signed by Scott Cohen, founder of The Orchard distributing company who opened his own music label. Given that it became the most famous Palestinian festival in such a short time, PMX was definitely not an easy event to organize, especially with the current political climate in Palestine and the many daily restrictions that Palestinians face in the midst of the occupation, but the organizers worked diligently and meticulously to make sure the Expo ran smoothly. Mahmoud Jrere started planning for the Expo a year earlier than its 2018 launch, and technical producer Abed Daa’dleh barely slept in the weeks leading up to the festival. 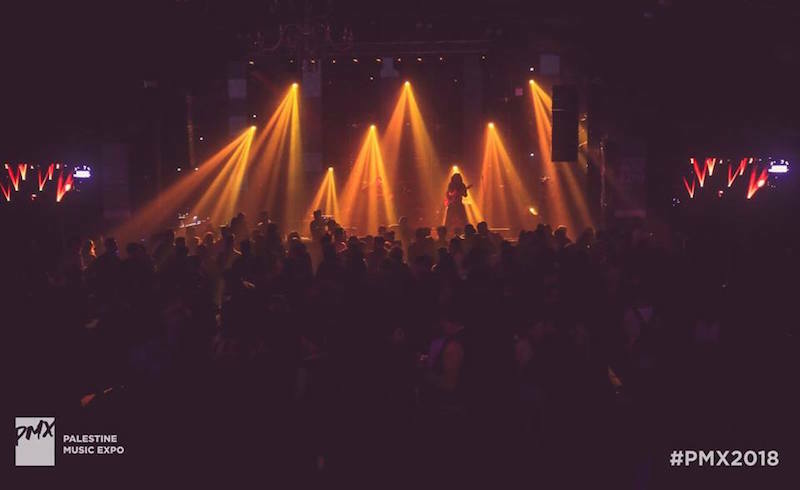 Rami attributes the fact that PMX became the most famous Palestinian festival to the, "combination of the delegates we are able to bring and the excellent production standards." The organizers had to navigate through the risks that the occupation provides. They had to keep a low profile for the most time while organizing the festival, for example, they could not announce that English musician Brian Eno was a special guest in this year’s edition, due to fears that he would be detained at the airport. Another difficulty that the organizers faced was the inability of three musical acts from Gaza to pass through Israeli checkpoints in Ramallah; the organizers had to record their shows and display them on the screens at the festivals - not an easy feat. On the 30th of March, PMX 2018 in Gaza was cancelled due to the Great March of Return events (Israeli snipers opened fire at civilians at this peaceful event), so instead of performing to a live audience, the bands had to record their sets without an audience and have them displayed at a later stage, all for a minimal fee. PMX 2017 was a big hit and a tough act to follow, but this year’s Expo is bigger than the last; it was even broadcasted live. Staying true to their commitment to provide opportunities to burgeoning Palestinian artists, the PMX organizers decided that their 2018 line-up would not include any artists that performed in 2017. Last year’s PMX edition managed to get 9 out of the 21 music acts deals. This year, they predict that even more artists will be signed. Additionally, the organizers already consider it an achievement that the delegates got to witness what Palestinian artists have to go through. Rami considers it a huge success that the delegates witnessed firsthand, "how the Palestinians live and how they lack freedom, and ow they're back home telling the world what they saw." Palestine does not lack any musical talent; the Expo proves that all Palestinian artists needed was a platform for the artists to showcase their ability in spite of the existing political climate. The musicians display how their hardship was able to make itself manifest through their music. Follow the PMX on their website and Facebook.